For many freezer owners, the freezer is a long term food storage solution that lives in the garage, the basement, or a spare room. It isn't something that lives in the high trafficked area like other kitchen whiteware. This makes second hand freezers an excellent option for purchasing your next freezer - so what if it has a scratch on it that you didn't put there? Freezers have a long average lifespan for whiteware at around 16 years, and if you are lucky enough to find one on the second hand market, they are usually only there due to someone moving out of the area and not being able to bring their freezer with them. When you buy a second hand freezer from Appliance Services in Christchurch, you know that your freezer has been properly cleaned, inspected, parts replaced if needed, tuned, and is covered by a warranty. Also important is the free delivery* that you get with second hand freezers. A standard freezer weighs between 70 - 140kg, almost the weight of a full fridge freezer and can be very difficult to move without the correct transport equipment & installation skills. Depending on the freezer you choose, and where in Christchurch you live, you may need extra people for a safe delivery. Stop into our show room and we can talk through what sort of food storage whiteware will suit your family's needs best. Appliance Services has a range of second hand freezers available for purchase from our store in New Brighton, Christchurch that range in prices starting from $495 including our warranty guarantee. We are so confident that our Overhauled Second hand freezers will run smoothly, that we offer a guarantee / warranty for your buying peace of mind. 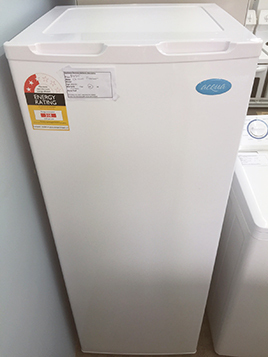 The length of time your freezer will be covered is clearly displayed on each second hand unit in our store in New Brighton. All of our whiteware are marked with 3 month, 6 month, or 12 months of coverage for your chosen whiteware - we'll put it in writing with your purchase for your peace of mind.